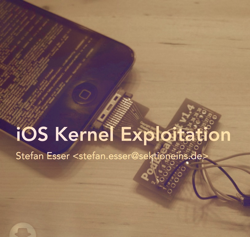 Stefen “i0n1c” Esser – a security researcher has written a reference pdf about stack buffer overflows and heap buffer overflows which are used to exploit the kernel (the component of iOS which acts as a bridge between software and the hardware) and ultimately, how this exploit is used to jailbreak the device. He is famous among the jailbreaking community for having found the exploit to jailbreak iOS 4.3.1 untethered. This exploit was used for jailbreaking iOS 4.3.2 and 4.3.3 (JailbreakMe used another exploit) but it was patched by Apple in iOS 4.3.5 and the upcoming iOS 5.